The Fayette County Family YMCA held the eighth-annual Celebrity Waiter Dinner Saturday. The fundraising dinner helps to fund YMCA program and raised $33,000 this year. Celebrity waiter Chelsie Baker participated in many ways during the event, including playing a basketball-themed game. The Fayette County Family YMCA hosted the eighth-annual Celebrity Waiter Dinner on April 6 at the Fayette County Fairgrounds to benefit the YMCA Annual Community Support Campaign. Fifteen waiters served 120 people while Rob Pittser oversaw the evening’s festivities as emcee, which featured an NCAA Final Four theme. In keeping with the theme, waiters decorated their tables, with Sandy Pulver, representing Bob and Nancy Hammond, taking home the Best Decorated Table award. Throughout the evening, waiters collected “tips” for providing outstanding service and entertaining the crowd, with all tips going to the annual support campaign as well. Larry Morris, representing Mid Atlantic Storage Systems, took home the Best Waiter trophy. In all, over $18,000 in tips were collected, with the event raising $33,000 in support of YMCA programs. Other waiters and waitresses contributing to an outstanding night of fun were Chelsie Baker, Father Dooley, Rick Mead, Stephanie Ratliff, Jennifer Sells, Angie Curtis, Godwin Apaliyah, Eric Wayne, Debbie Southward, Candis Conley, Tosha Niciu, Sarah Thompson and Mike Dexter. The YMCA wishes to thank dinner sponsors Huntington Bank and US Bank. The Fayette County Family YMCA opened the facility on Civic Drive in Washington Court House in October of 2007. It now serves over 6,200 people each year. The YMCA is a 501c3 non-profit organization. Each year the YMCA provides over $60,000 in scholarship assistance that provides youth and families in our community the opportunity to benefit from programs and services that strengthen the community through youth development, healthy living and social responsibility. Over 120 YMCA volunteers help provide services each year, and the YMCA also employs 115 full-time and part-time staff. This includes staff that provide child care and enrichment for over 80 infants-preschoolers at the YMCA Kid’s World of Learning at Sugar-Creek Packing. The program is open to anyone in the community. The YMCA also provides swim lessons, youth sports, and before and after school and summer day camp opportunities for kids at the YMCA facility. A board that currently consists of 17 community members provides oversight to the organization and works with YMCA staff to fully implement a strategic plan, which includes further facility development and continuing to increase collaborative efforts with local groups to address community needs. For further information about YMCA programs and services, call 740-335-0477 or look online at www.faycoymca.org. https://www.recordherald.com/wp-content/uploads/sites/27/2019/04/web1_Chelsie-Game.jpgThe Fayette County Family YMCA held the eighth-annual Celebrity Waiter Dinner Saturday. The fundraising dinner helps to fund YMCA program and raised $33,000 this year. 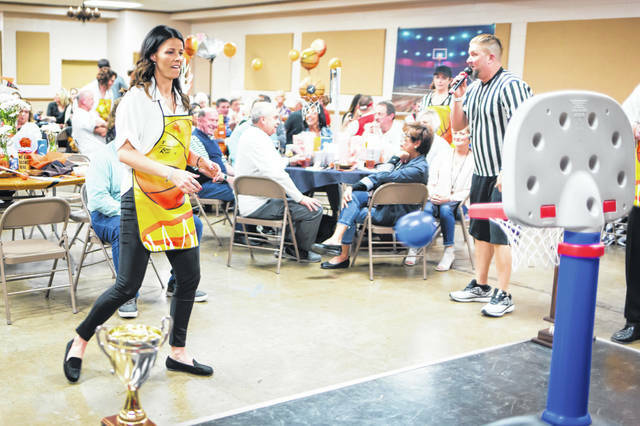 Celebrity waiter Chelsie Baker participated in many ways during the event, including playing a basketball-themed game.